Less than a month after a deadly, national outbreak of fungal meningitis stemming from the New England Compounding Center, it has been revealed that the pharmacy’s sister company, Ameridose LLC, has major issues with sterility as well. 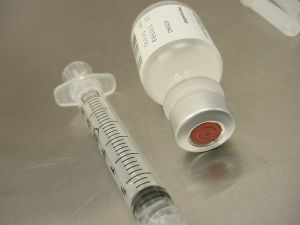 Ameridose, also a Massachusetts pharmacy, based in Westborough, is a major supplier of injectable drugs given to pregnant women, children and asthma sufferers. This company was founded by the brother-in-law of the man who founded the New England Compounding Center. We previously reported this relationship in our meningitis coverage shortly after the outbreak began. Our Boston meningitis lawyers understand that in the wake of the tragedy stemming from contaminated steroid injections from the NECC, federal officials have found that Ameridose facilities, too, weren’t sterile. In fact, there were leaky ceilings, insect issues and a rouge bird flying around the facility. So far, there have been no illnesses reported as a result of the Ameridose injections, but there have been complaints with its products dating back to at least 2008. The fact that people didn’t know about the extent of the sterility issues at Ameridose or the complaints made by others probably led to fewer reports. The company has manufactured and shipped some 70 million units of product since 2008. Specifically, the drugs the company is known for making include fentanyl, oxytocin, heparin and medications used to deliver epidurals. The U.S. Food and Drug Administration, in a 20-page report, indicated the top complaint made by doctors to the company had been a lack of effectiveness or ineffectiveness. In some cases, children were given medication before surgery to calm them. However, the drug did not work, despite the children being given the maximum dose. There were also pregnant women given Ameridose-produced oxytocin to bring on labor, and ended up reporting fetal distress, severe post-birth bleeding and shortness of breath. Additionally, one complaint indicated a patient was given a heparin, a blood-thinner, and ended up having a life-threatening reaction. And when two cancer patients were given a pain drug called fentanyl, both reported having gone into respiratory distress. Perhaps more troubling is that when doctors reported these incidents to Ameridose, they were not recorded as “adverse” events. Additionally, the FDA discovered at least 58 occasions when Ameridose staffers found evidence of contamination with fungi or bacteria in liquids that were supposed to be sterile – liquids that would go on to be used for anesthetic and pain relief injections. And yet, it did not investigate. When testing indicated that the end products weren’t sterile, the company reportedly took no steps to find out what caused the contamination or to correct it. In another 45 instances when lab staff found mold or bacteria in the manufacturing areas, Ameridose didn’t bother to investigate, the FDA reported. When reports of the fungal meningitis outbreak first emerged, Ameridose attempted to distance itself from NECC, with NECC’s top pharmacist, who also worked for Ameridose, issuing his resignation. On Oct. 31, Ameridose recalled all of its unexpired products after FDA inspectors indicated the facility could not consistently assure that its products were safe. The fungal meningitis outbreak has so far resulted in 32 deaths and caused another 438 people to fall severely ill. If you or a loved one have been affected by the fungal meningitis outbreak stemming from the New England Compounding Center or have fallen ill as a result of medication from Ameridose , call the Law Offices of Jeffrey S. Glassman for a free and confidential appointment — 1-888-367-2900.